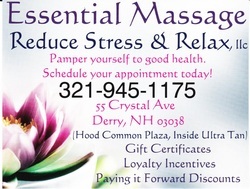 The hustle & bustle of life is all around in this quaint plaza, shopping, restaurants and coffee cafes around every corner, and minutes from Manchester or Salem off I93, Essential Massage Reduce Stress & Relax LLC is located inside Ultra Tan @ the Hood Common Plaza at 55 Crystal Ave, Derry NH 03038. It's best to text and schedule an appointment, or please feel free to contact me at (321) 945~1175. I look forward to assisting you in any way possible. Your support is truly appreciated! Thank You. See us here to, getting the word out to ensure stress reduction and relaxation!